It’s Back to Basics here at BNV, showing you how simple it is to throw together fast and healthy meals using ingredients you probably already have on hand. 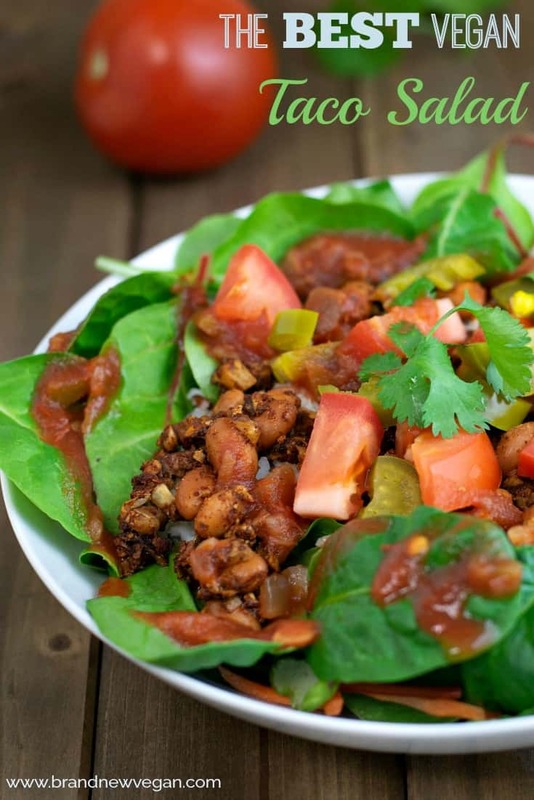 For instance, this Vegan Taco Salad comes together in a flash and is chocked full of fiber, vitamins, nutrients……oh and taste too! What is this “Back to Basics” you ask? I know a lot of people ….shall we say indulge a little more than they should over the holidays….me included. A little vegan cheese here, some vegan desserts over there, mixed with a glass of wine at this party and a beer or 2 at that party…. Next thing you know the pants feel a little tighter, the blood pressure seems a little higher, and you get on the scale to see what’s happening and BAM! It doesn’t take much to add up. I know. So rather than do yet another reset diet, or mini as some people will do….I decided to just go Back To Basics…. 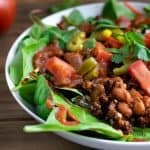 Meaning a whole food, plant-based diet focusing on lots and lots of fresh, unprocessed foods like greens, veggies, legumes, whole intact grains, and starches. And temporarily eliminating the higher calorie-dense foods like nuts, seeds, avocados, bread, and of course alcohol. Meals that are not only wholesome, nourishing, and nutritious…..but also taste great. Like this very simple Vegan Taco Salad. Hope you enjoy it. And if you’d like to JOIN us on our 7 day – Back to Basics Bootcamp – be sure and join our BNV Facebook Community. So the idea of this meal is very simple. We’ll start with a handful or two of any fresh greens you happen to like. In my photo, I used a package of Organic Spinach, Kale, Chard, and shredded Carrot. Then we’ll add a big scoop or two of your favorite whole grain. I used 2 cups of a Wild Rice Blend that I cooked in my Rice Cooker. You could also use Brown Rice, Quinoa, whatever whole grain you choose. On top of THAT, I added a mixture of my Amazing Cauliflower Taco meat and a can of Pinto Beans. I mixed 1 cup of riced Cauliflower and 1 cup of finely diced Portabella Mushrooms together in a bowl. Added the soy sauce and the remaining Taco Seasonings, and mixed well. The entire recipe for my Tacos including the seasonings can be found by clicking the link above. Then instead of baking this like normal, I simply dumped it into a frying pan along with a can of rinsed and drained Pinto Beans. Simmer until heated through – about 10-15 minutes. Add a big pile of this ‘taco meat’ to your salad, then simply garnish with fresh tomato, jalapeno, cilantro, and your favorite sala. Simple, quick, very healthy, and believe me – it tasted amazing. Best Vegan Taco Salad I ever had. Hey, that would make a good title – I think I’ll use it! 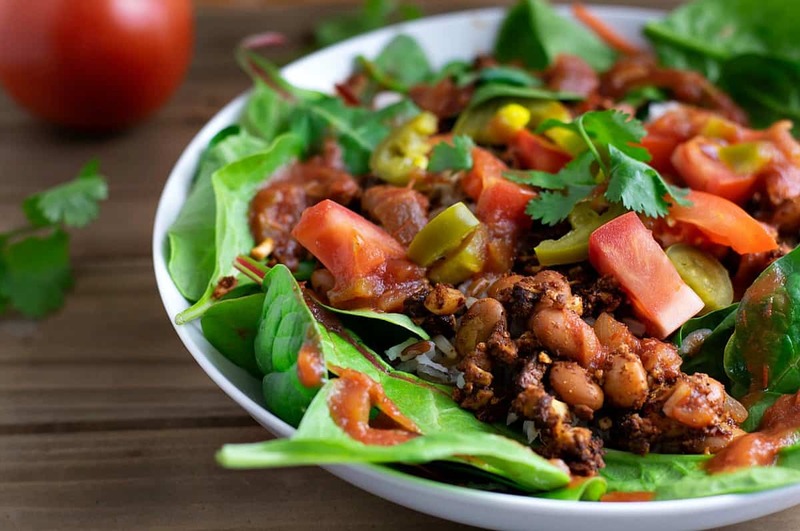 It’s Back to Basics Week here at BNV, where I show you just how simple it is to throw together fast and healthy meals – like this Amazing Vegan Taco Salad. Prepare the rice according to package instructions, set aside. Mix the taco ingredients according to the recipe instructions. (to lower the fat content and reduce the calorie density – leave out the walnuts). Add taco mixture to a large pan and stir in the rinsed & drained pinto beans. Simmer until heated through, 10-15 minutes. Tried your Texas Chili recipe, it was excellent. Best chili I have had. The flavor was outstanding. Thanks you. I was bored with my meals and needed something quick and tasty and this hit the spot! So good! It will definitely join the recipe rotation!